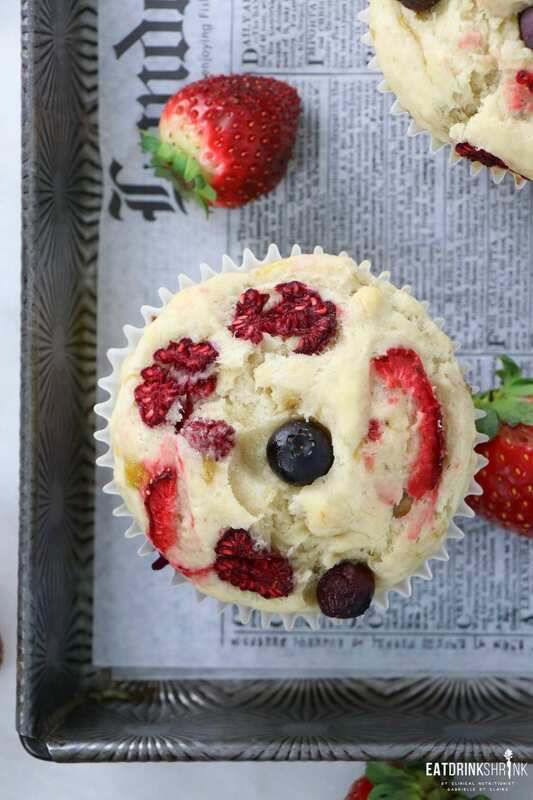 Vegan Triple Berry Muffins - Eat. Drink. Shrink. If you know me, you know I love a good weekend muffin! 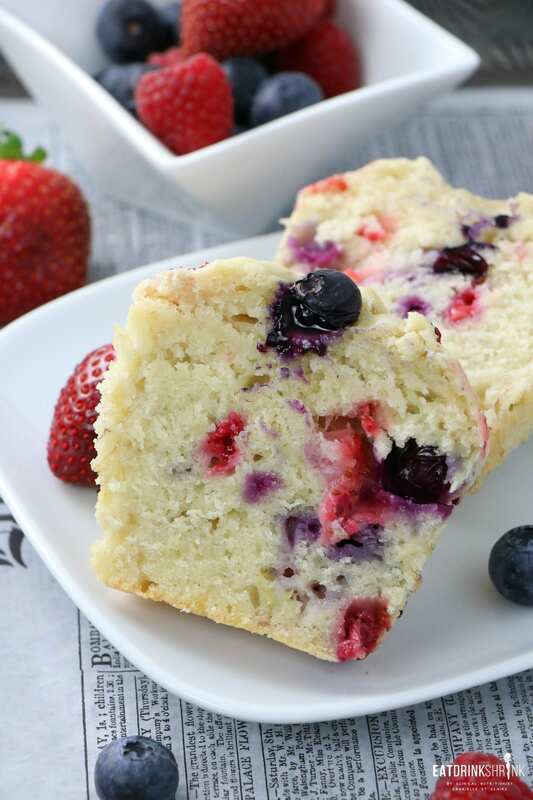 While dreaming of warmer temps my mind was instantly filled with berries! While I love each by themselves, together they create the perfect flavor. Blueberries offer a mild sweetness, strawberries a lil more, and raspberries offer a tart flavor, which all blends seamlessly together. For the longest time I gave up muffins. All the vegan recipes I explored just fell flat and as a results I didn’t make them for years. Once I found the perf combo I whipped up countless flavors! To date I’ve done Lemon Blueberry, Double Dark Chocolate Chip, Eggnog, Gingerbread, Peanut Butter & Chocolate, Dark Chocolate Strawberry, Orange Cranberry, Peach Oatmeal, Strawberry Basil, Raspberry Almond, Pumpkin Chocolate Chip, Cinnamon Apple, Blueberry Almond, Green Machine , Lemon Rosemary, & a Dark Chocolate & Raspberry muffins! What’s fab about this recipe, is everything! 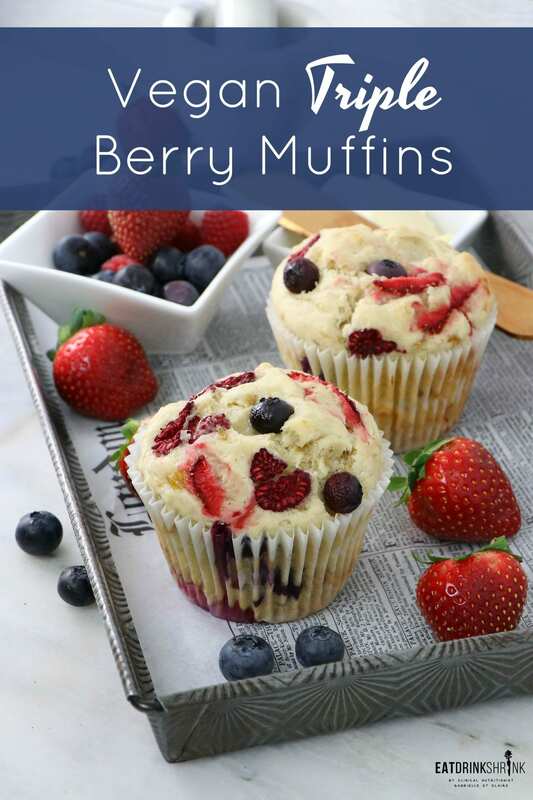 It’s my staple muffin recipe, quick, easy, affordable, packed with berries, light, fluffy, perf for any season, perf for brunch, and perf for those cold winter days when you’re craving warm weather eats!! 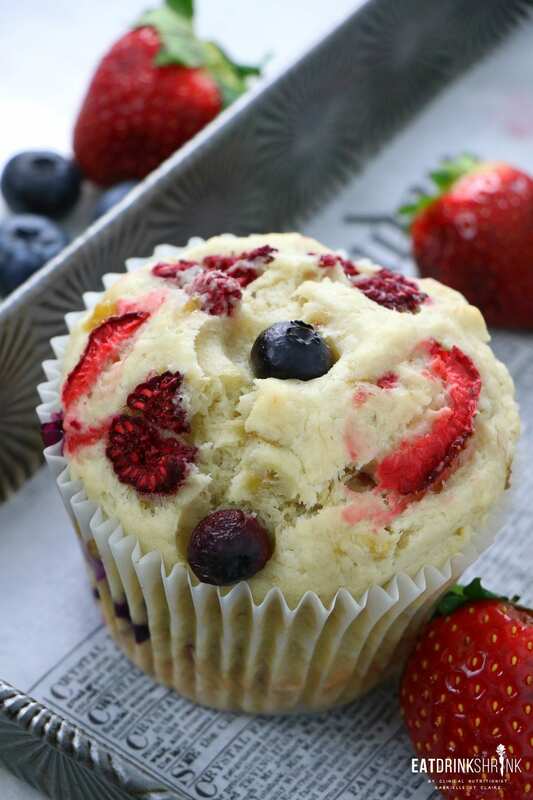 If you love all things berries, you’re going to love these vegan Triple Berry Muffins!! Heat oven to 350 degrees F. For big-topped muffins, line 8 standard-size muffin cups with paper liners. For standard-size muffins line 10 muffin cups. 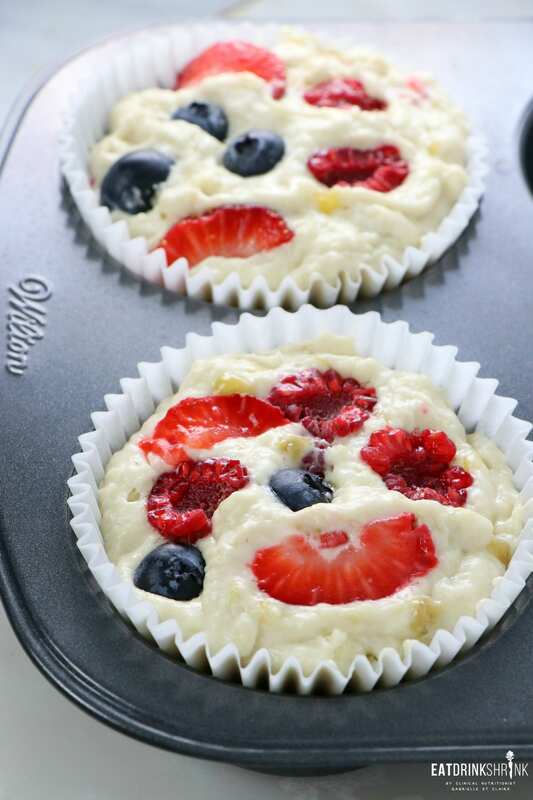 (optional) Fill the remaining cups with 1 to 2 tablespoons of water to help the muffins bake evenly. Whisk the flour, baking powder and salt in a large bowl. Add melted coconut oil, sugar, mashed banana, room temp almond milk, and vanilla extract to a bowl and whisk until smooth. 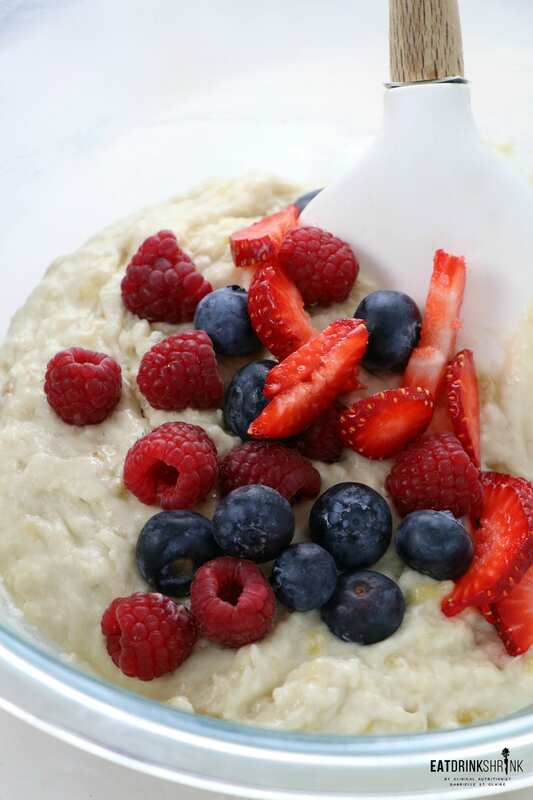 If the mixture is too cold and coconut oil begins to solidify, simply pop in the microwave for a few seconds. Add wet to dry ingredient lightly combine. Do not over mix. 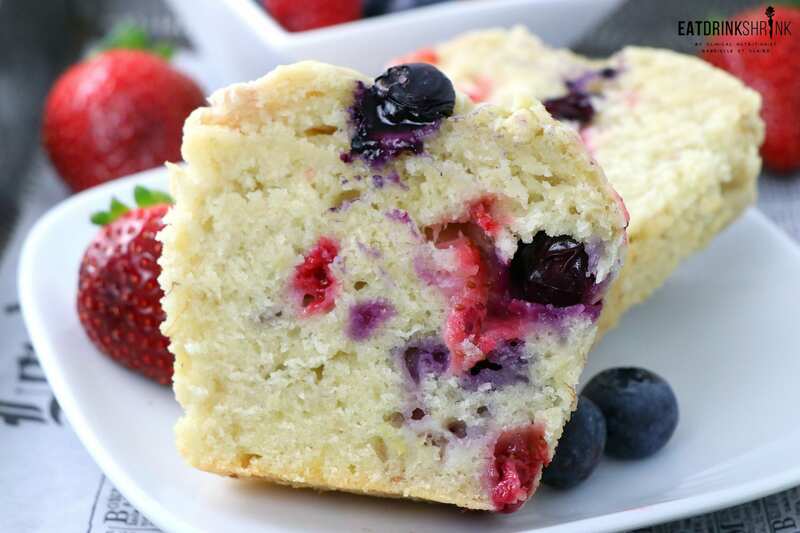 (The muffin batter will be quite thick) Fold in the fresh berries saving a few to throw on top, and fill into the muffin cups.